A group of House Republicans called Tuesday for the appointment of a second special counsel to investigate concerns about the Department of Justice and FBI, just days after Trump first called for an investigation into whether his campaign was “infiltrated or surveilled” for by an alleged FBI informant. At least 19 House Republicans critical of special counsel Robert Mueller’s investigation signed on to the new 12-page resolution on Tuesday calling on Attorney General Jeff Sessions to appoint a special counsel to investigate “misconduct at the highest levels” of the DOJ and FBI, Rep. Lee Zeldin, R-N.Y., said. 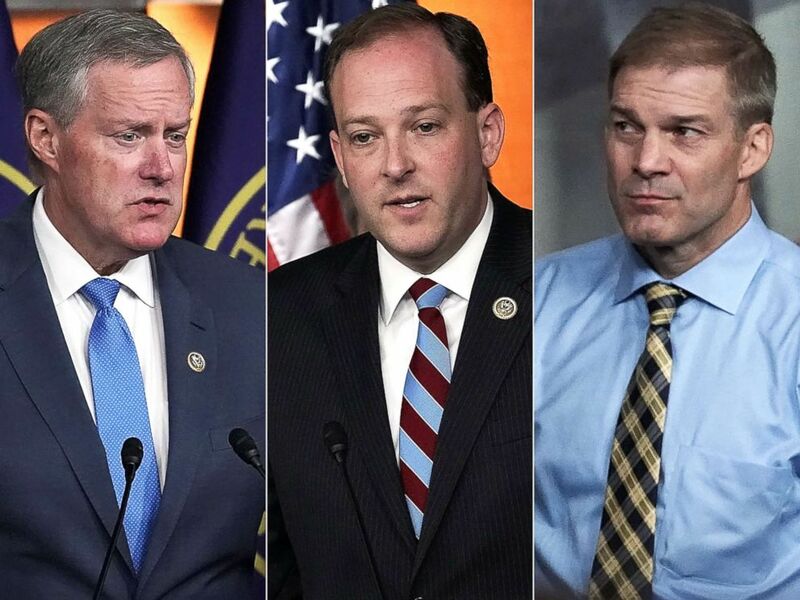 Rep. Mark Meadows speaks as (L-R) Rep. Lee Zeldin, Rep. Matt Gaetz and Rep. Jim Jordan listen during a news conference May 22, 2018 on Capitol Hill in Washington, D.C.
House GOP leadership had not committed to bringing up their measure for a vote on the House floor, the Republicans said. While some Republicans have previously pushed for the appointment of a second special counsel earlier this year, Sessions selected the top federal prosecutor in Utah to work with the Justice Department inspector general to investigate concerns raised by congressional Republicans. Since then, conservatives have seized on new reports from the Washington Post and New York Times reporting that the FBI sent an informant to talk to several campaign aides during the 2016 election as evidence that a second special counsel is needed. 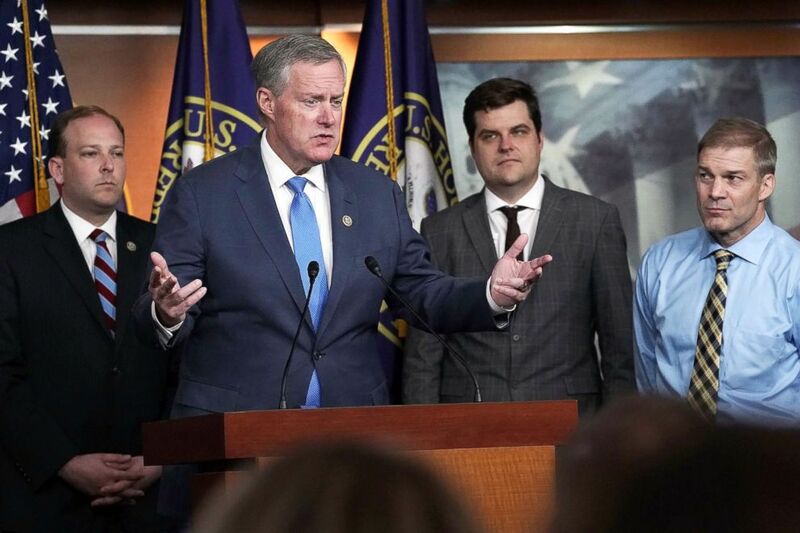 “It’s a drastic step, but quite frankly these are drastic facts that continue to bubble to the surface and its time that we get a response,” Rep. Mark Meadows, R-N.C., said. The group, some of the president’s most vocal supporters on Capitol Hill, have vented about the Mueller investigation and DOJ for months, accusing the department of not fulfilling requests for documents and information and its senior officials and some investigators of political bias, citing some members' donations to Democrats and Democratic causes. Mueller and the Trump-appointed Rosenstein are registered Republicans, and the special counsel's team is made up of members affiliated with both parties. Justice Department guidelines do not allow consideration of party affiliation to affect personnel decisions. Rep. Mark Meadows speaks as during a news conference, May 22, 2018 on Capitol Hill. |Rep. Lee Zeldin speaks during a news conference, May 22, 2018, on Capitol Hill.|Jim Jordan listens during a news conference, May 22, 2018, on Capitol Hill. “We need a special prosecutor to investigate the special prosecutor, to investigate Rosenstein,” Rep. Louie Gohmert, R-Texas, said. “But you can’t be the one to fire him because we’ve got some weak-kneed Republicans out there who will come after you for firing the guy who needed firing,” he recalled while holding a photo of himself whispering in Trump’s ear last summer. Trump also weighed in on the informant allegations again Tuesday, after meeting with FBI Director Wray and Rosenstein at the White House on Monday. “If they had spies in my campaign, that would be a disgrace to this country, that would be one of the biggest insults that anyone’s ever seen, and it would be very illegal," Trump said at the White House. The Justice Department said the agency’s inspector general tasked with conducting oversight of the department would look into the questions raised by Trump as part of its ongoing investigation into the government surveillance of former Trump campaign foreign policy adviser Carter Page during the presidential campaign. The White House announced Monday that congressional leaders will also be invited to a meeting organized by chief of staff John Kelly to review the classified information related to the reported intelligence source. Press secretary Sarah Sanders said Tuesday the meeting would be Thursday. Meadows said Tuesday that Democrats should be able to view the documents, in addition to House Intelligence Committee Chairman Devin Nunes, R-Calif., and Rep. Trey Gowdy, R-S.C. He also said that Trump did not request a second special counsel. Sen. Mark Warner, D-Va., the top Democrat on the Senate Intelligence Committee, said he and GOP chairman Richard Burr declined the offer of a DOJ briefing on the documents, citing their sensitive nature. "I don’t think any of us have any idea what the White House is doing, except that they want to use any mechanism they can to get their hands on materials they think will be useful for their legal defense team and they’re willing to break down the wall of independence between the White House and the Justice Department to do it," he said. "Sadly they have allies in Congress who are all too happy to help in destroying these institutions," Schiff said.